I had Shanghainese for dinner with my parents and relatives last night. My sister is back home for spring break, so we had to get the honey walnut shrimp! We rarely order this dish unless we have a few young adults/kids in our party, because shrimp has high cholesterol. The honey glazed walnuts are so good; walnuts are supposedly good for your brain! 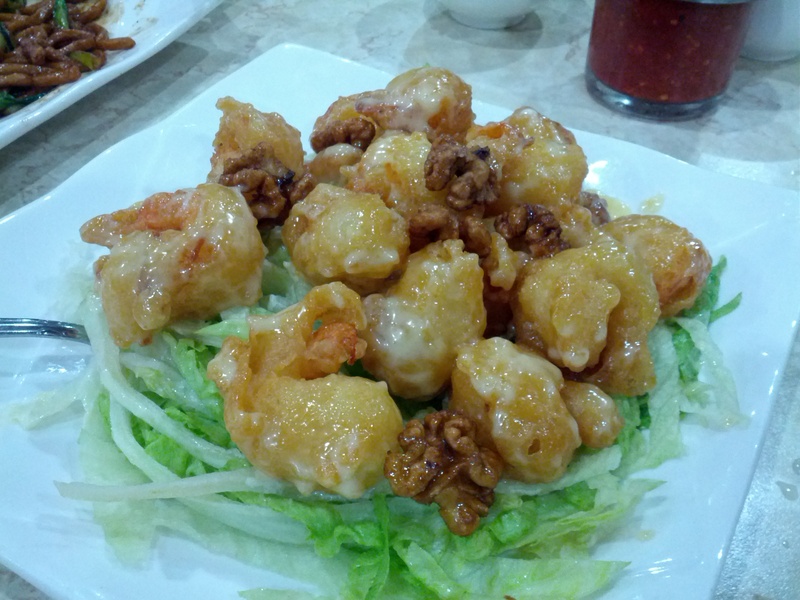 Many Chinese restaurants in the US carry the honey walnut shrimp dish, as it is very popular with Americans. Several restaurants will carry multiple regional dishes. While Fortune Kitchen’s dishes are mostly Shanghainese, they carry a few Dongbei (Northeast China) and Cantonese/HK style foods. I’ve seen the shrimps cooked in two ways; deep fried or pan fried. The honey walnut shrimps are usually on a bed of deep fried (white) rice noodle. The honey walnut shrimps we ordered here were on a bed of lettuce- much healthier than the white rice noodles! Some restaurants will have it on a bed of broccoli. I didn’t know this was a HK dish! one of my favorite dishes of all time!!! not diet food, for sure!